Almost every person in Andhra Pradesh knows about this tasty rice paper sweet which just melts in mouth. Seeing the thin sheet I just felt that it is a very easy job to make pootarekulu. I went to market and bought a big pot. I have seasoned the pot by applying oil while heating it. I also prepared thin batter with rice. Then I tried to make the sheet by applying a thin coat on hot pot with a cloth dipped in batter. To my surprise it was a failure. Then I seasoned the pot further and tried and tried and failed repeatedly. Then I thought, as the size of the pot is big, the flame is not reaching to the top. Then I have bought a small pot and started trying---yet failures continued. During this process, I had to scrape the dried batter from the pot and clean the place. One would not believe, it was a mess and torturous chore — the hope of atleast getting one sheet on this pot, I expected to forget the failures and disappointments which I faced till now. Pootarekulu on the pot remained elusive. Then I came to know that pootarekula kunda is specially made and it has holes on it. I could not believe this and felt like giving it a try by making holes on the pot I was trying---yet I did not get the pootareku. Then I gave it up till I read an article in newspaper about making of pootarekulu in Vizianagaram district. I felt challenged to learn and make pootarekulu. I enquired and could get a help from Sri Satyanarayana Garu of IKP who took me to Merakamudidam village in Vizianagaram district. I took my pot to that village and wanted to know the reason for failure. There Smt. Ramulamma taught and gave reasons as to why I was not getting a pootareku at my place. The villagers were really helpful and taught me in detail. I took the opportunity and learned the art of making rekulu on the hot pot. I can’t express my happiness in words when I took the pootareku in my hand which I have made. This visual experience helped me understand easily why and where it failed. Having learnt the art of making pootarekulu I felt like sharing all the minute details in this process with my viewers. 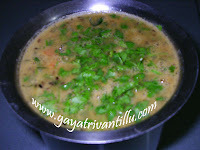 So let us see in detail how to make pootarekulu in one’s home itself. The pot used to make pootarekulu is not ordinary pot which we use to store water. A thin coating of fine clay is applied on the pot and then heated to get a smooth surfaced glazed pot. Also this pot has three holes equidistant from each other. Turn the pot and observe the surface---it has glaze and appears smooth when touched with fingers. The thickness of the ordinary water pot is much lesser than the thickness of the pootarekula kunda. 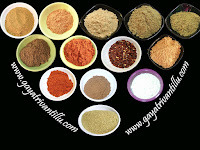 To make pootarekulu at home the flame of the ordinary gas stove will not be sufficient. So invest in a single burner stove that is generally used by caterers in parties and functions. This single burner stove has a big burner. Take a new pootarekula kunda and place it on the gas stove in inverted position. See that the mouth of the pot and the surface of the stove on which it rests are almost of the same size. With the help of wire pieces fix the pot to the gas stove. As the pot has three holes pass a wire through each hole and fix as shown in the movie clip so that the pot sits firmly on the gas stove. Now switch on the flame and heat the pot. Take a thick cloth and fold it into a thick bundle. Take 50ml oil. It requires less quantity when using thick oil like groundnut oil or palm oil etc.. Dip cloth in oil and smear the pot with the oily cloth. Coat the pot with oil while it is getting heated up. After some time observe that the pot absorbs all the oil smeared on it. Then again smear oil on the pot taking care to cover the entire surface of the pot. Observe that the thick cloth we are using to smear oil starts to tear due to the heat of the pot. That is the reason we use thick cloth as it will protect our hand. Continue smearing oil while heating the pot till all the 50ml oil is used up. Now switch off the flame for 30 minutes and leave the pot on the stove. After 30 minutes switch on the flame and smear oil on the pot. Now start making rekulu and test whether the pot got seasoned or not. Dip cloth in the batter and coat the batter on the hot pot. Observe the black coating of the pot sticking to the cloth---do not worry as we are using this batter only to check the seasoning of the pot. Observe the sheet formed is broken into pieces—a failure. This indicates that the pot is not yet seasoned. Remove the broken sheet from the pot and scrape any batter sticking on the pot with a plate or a blunt knife. Repeat the process of smearing oil, coating the pot with a thin layer of batter. Observe that it failed once again. Repeat this process till the pot is seasoned. In the process of scraping the broken pieces of sheet, some particles may fall into the batter as the batter is kept near the pot. In such cases strain the batter, remove the particles and use that batter once again till the pot is seasoned. After trying for some time you will get a thin sheet of the rice batter—this indicates that the pot is seasoned. Here in my case I got the sheet after seasoning the pot with oil and applying nearly 20 coats of batter on the pot & scraping the broken sheets. Be careful as the scraped sheet particles may catch fire easily when they fall near the gas burner. As soon as you scrape the sheet off the pot, sweep the broken sheet particles away from the gas stove to avoid this danger. The area around the pot becomes messy while making pootarekulu. Hence it is advisable to make these pootarekulu in an open area where it is easy to clean rather than in kitchen. Now the pot is seasoned to make pootarekulu. Observe that the thick cloth which we have used to smear oil on the pot gets torn to a larger portion due to the heat on the pot. Use the same cloth to make pootarekulu---hence keep this in a plastic cover and store till use away from dust & dirt. Similarly if you are not using the pot immediately cool it and store covered in a plastic bag—as the pot is seasoned and got a coating of oil on it, dust settles easily on it. For making pootarekulu, use unpolished rice or parboiled rice but not the regular polished rice which we use for cooking in well to do families. The starch in the unpolished rice helps in getting fine pootarekulu unlike starch less polished rice. As parboiled rice also has starch in it, it can be used.Mostly the poor villagers use the usual coarse variety of new rice which they grow in their fields or which the governments gives them at subsidised price through fair price shops. Use a soft cotton cloth for making pootarekulu. Take care that the cloth has no loose strings while making pootarekulu. When a thin layer of batter is coated on the pot with a cloth which has loose strings, observe that a line forms on the sheet due to the string on the cloth. Once the sheet is ready to be removed from the pot, it breaks along the length of the line. So remove such strings before applying the coat on the pot. One option is to do a patch work by applying batter with finger on the cut portions and it would be difficult as the hot pot burns your fingers!!! So another option is to remove strings before coating the layer on the pot. One more option is to use a cloth which has no strings!!! For the third option take a new blouse piece. Open the blouse piece and observe that two sides of the cloth are machine pressed. Use this machine pressed side to coat a layer on the pot so that one will not have the string problem. Take a double layered piece of 12” by 9” measurement. Use the 12” side to coat the layer on the pot. Stitch the other side of the double layered cloth for convenience. Following the above mentioned points one can make good quality pootarekulu at one’s own place itself. Usually in coastal districts of Andhra Pradesh these rice paper sheets as well as the sweet prepared with these sheets are available—whereas in other parts it would be difficult to get the sheets. So enjoy making this sweet which melts in mouth. Watch my other video to be uploaded which discusses about the recipe and its preparation. Now this sweet delicacy can be made at your home itself!!! Thanks a lot for sharing the pootharekulu technical details on your website. I felt so happy after seeing it. But, unfortunately I cannot do it here in Germany. The kind of pots and stoves required for this recipe cannot be easily found here. But, after seeing your video I felt as happy as I ate pootharekulu. I have sent the link to my mother and wanted to share the excitement with her. Maybe I will try to do the recipe someday when I am back again India. just saw your video on putharekulu. hatsoff to your passion to learn!!! you just proved that if there is a will there is a way. you have always been an inspiration. thanks once again! I tried reading it through your website.... at least 5 times..... sorry, I cannot prepare this.... because of the elaborate preparations involved.